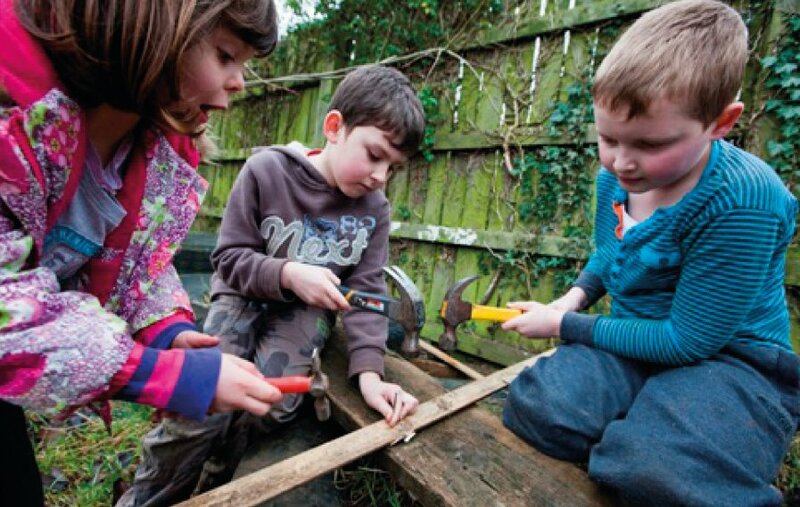 ‘Play – and particularly play outdoors – teaches young people how to deal with risk. Without this awareness and learning they are ill equipped to deal with adult life. Outdoor play and learning is an important part of our children’s education. There are in fact two versions of the tool. The first is a blank form (5 MB, Word 2007 format) which is ready for use, and also easily adapted and customised. The second version is a hypothetical worked example based on a tree swing in a municipal park, which illustrates the approach (7 MB, pdf format). The thinking and context behind the RBA form is set out in its longer predecessor Managing Risk in Play Provision: Implementation Guide (published in a revised edition in 2013). The HSE’s own helpful High Level Statement on risk and play – which everyone concerned to promote a more balanced approach should be familiar with – is here. This post of mine gives some more background on it, while this post shows just why it is so valuable. I should confess a personal interest: I was one of the co-authors of the form, along with my longstanding collaborators Prof David Ball and Bernard Speigal of PLAYLINK. The form has benefited from comments from members of the Play Safety Forum, and also feedback on early drafts from a number of play providers, including an after-school club, a play equipment manufacturer and two local authorities. David, Bernard and I – along with many others – share a worry about the spread of what the HSE has called ‘useless paperwork mountains’. So it is reasonable to ask if what the world really needs is yet another form. But the demand for accountability and paper trails is not going to go away any time soon. What is more, there is a place for well-designed forms that help people make the sometimes difficult decisions that are involved in managing risk in children’s play and learning. If forms are our tools, we should make sure that we are using the right tools for the job. I know that some providers and designers have been using RBA for some years now, while others have yet to make the shift. I plan to share some case studies here in upcoming posts. But in the meantime, I would love to hear your experiences if you have implemented risk-benefit assessment in your setting or service – or if you have not, what you think are the biggest barriers to change. This entry was posted in Risk and tagged Health and Safety Executive, HSE, Play Safety Forum, Risk, risk assessment, risk benefit assessment. Bookmark the permalink. What a wonderful way to help practitioners and parents feel more confident allowing children to take acceptable risks. Very pleased to see this launched. Well done all for the long haul! But well worth it. Tim, an extremely useful blog (yes, I would say that, wouldn’t I?). You are right to draw attention to David, your and my concern about generating yet another form. At present, for the reasons you say, it is a necessary, pragmatic response to prevailing conditions and the need for, in this case, play providers, to demonstrate they have come to reasonable decisions in the context of – crucial point this – their values and understandings in respect of play. The axis around which the RBA form revolves comprises values and understandings about play and its relationship with beneficial risk taking. As part of that latter point, I’ll also take this opportunity to alert your readers to the significnace we gave to taking hold of the language of health and safety/risk assessment. By way of example, we made the conscious decision not to use the term ‘control’ as in ‘control measures’ and we explicitly offer the option of introducing ‘additional features or activities that increase the level of risk and challenge or other benefits’ in cases where the risk-benefit judgments suggests that what is on offer is rather too tame. There is of course the longer term job still to be done – among others – , which is to make inroads into the assumption that RBA judgments can in all cases be captured on paper. They cannot. This perhaps is particularly the case in staffed provision where decision-making is, and has to be, a continuous stream of often minor, but cumulatively significant, responses to situations as they arise, moment by moment, on the ground. So, keep your sleeves rolled up there is work yet to be done. Thanks for the thumbs-ups. Bernard – thanks for those helpful points. The question of when to document is one on which I have seen almost no helpful debate. The HSE’s guidance says “you do not need to include insignificant risks. You do not need to include risks from everyday life unless your work activities increase the risk.” I think we can agree that is less than helpful in answering the question! Interestingly, the same faqs page says that only organisations with more than 5 staff need to record risk assessments – but my hunch is that many ‘exempted’ organisations and individuals think they have to do so too. What a muddle! Pingback: November Outdoor Learning News — Creative STAR Learning | I'm a teacher, get me OUTSIDE here! Bernard makes a great point regarding risk, in that it is usually either ignored if it is small or avoided if it is large, but when people who are less than fully aware begin ignoring risks, it leads to an accumulation that certainly will culminate in an accident. I look at risk in two ways. First, my experience of 20 years as an Aircraft Maintenance Officer and an Aircraft Accident Investigator leads me to look at risk in one way, which is to see how much risk can be accepted and accumulated while still performing the mission. In this perspective, continuous evaluation and constant feedback are essential and this necessitates lots of forms and lots of documentation and lots of activity actually reducing risks which tend to accumulate over time, and manifest in sporadic ways. Second, my experience as a parent makes me look at the pedagogical value of risk. Children only learn through experience, so letting them fall is as important as seeing them succeed. The foundational difference between the two perspectives is that the end result is either owned by me (as a parent) or someone else (the pilot, the crew, the Air Force, etc.). As long as governments feel responsible to answer for the results of providing play spaces, someone will have to fill out forms and document their “accountable” actions. The degree of granularity can often, though, be reduced if the responsible party is “professional”, not just trained, but “professional”. Perhaps a corps of professional play providers should be the next major push?? Re the HSE’s FAQs (gotta love those TLAs), when we run 50 Dangerous Things camp in the school holidays we have fewer than 5 staff but ALWAYS risk benefit assess our activities, even the apparently insignificant ones. By their very nature, our activities could affect the outcome of every day behaviours. It’s not onerous and we obviously also RBA dynamically during the day. I should add that whilst the new doc is great, it is very lengthy! The version I use (created by me) is one side of A4 for each set of activities (e.g. playing the woodland; using tools; parkour; off site visits). I cover the same ground as this new form, but my form is also passed on to schools and settings as part of in depth development projects with them and it is simple and accessible enough to encourage them to take on the task and not be intimidated by it. We have found that shorter forms make it more likely that parents will read (ok, skim and scan) them whilst they are dropping off or picking up children, and we are very keen that they do. I think the engagement of parents in risk benefit assessment as opposed to risk assessment is crucial in play situations. Most of them have never heard of the term and don’t understand it until its explained. I also use the cunning ‘reverse risk assessment’ approach: asking ‘what dangers could children face if they weren’t able to [insert risky activity]?’. Parents and teachers / practitioners love discussing this and it instantly and clearly makes the point about weighing up risk vs benefit. This is a great step forward however, thanks for highlighting it, Tim and thanks PSF for working it up. It will be a huge help for those of us trying to promote this approach for outdoor play, over traditional RA. Thanks for this Julie. And there we were thinking we’d done well to reduce a 120-page book to around 8 pages! I can see it might look long for your purposes – but it does need to cover a wide range of situations including complex construction projects. Also – the Word version is eminently customisable. I can see, for instance, that the introductory text will be superfluous for some. Help me help commuities to kick the safety surface habit!! Hi, I have just had a quick glance over your writings and hope to sit down and absorb them in more detail. it is welcome news and i hope that this shift may help in the almost everyday argument for play advocates when working with communities in developing play spaces where there are constant requests for rubberised surface to make the space ‘safe’ as if this magically cancels out maintenance, dog fouling, glass etc. Debbie, With Tim and others I have been critical of the obsession with ‘safety’ surfacing, in particular rubber. I have just posted an article ‘Standards: Time for reform’ that aims to take the argument forward. It may be helpful.